WASHINGTON – Facing charges that she was dodging constituents, Rep. Martha McSally, R-Tucson, will be at a town hall Thursday – the same day that a group of critics has scheduled a separate town hall that McSally spurned. The dueling town halls come as Democrats press a national campaign painting GOP lawmakers as reluctant to face voters angered by President Donald Trump and the repeal of Obamacare – anger that has boiled over at some town hall meetings around the country. 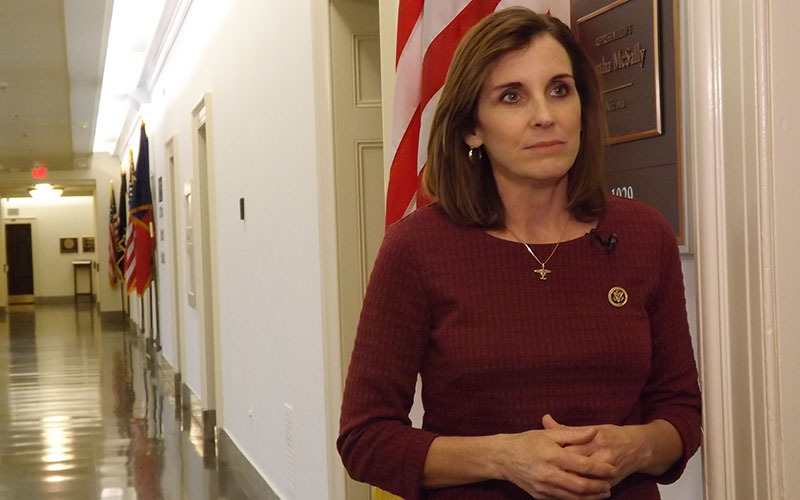 A spokesman for McSally said she agreed to attend a Thursday town hall in Sahuarita that will be hosted by the Green Valley News simply because “it fits into her schedule.” Congress is on recess this week so members can return to their districts. That means McSally will not be at a town hall about 20 miles away in Tucson that was scheduled weeks ago by two groups – McSally Take a Stand and Indivisible Southern Arizona – who were upset by what’s going on in Washington and wanted to speak to their congresswoman. That meeting will still go on, said Marion Chubon, founder of McSally Take a Stand, even though some of their supporters plan to peel off for the Sahuarita meeting. “We are happy she’s going to be engaging … if it’s truly an open, honest discussion,” Chubon said. “We’re looking forward to hearing McSally try and explain to her constituents why she’s planning on taking health care away from thousands of Arizona families without a replacement,” the statement said. The DCCC has been making those charges for weeks – that Republicans are refusing to hold town halls because they don’t want to face angry voters. McSally has been a frequent target for failing to hold an in-person town hall. But one political analyst said that while there “may be some evidence, here and there,” of Republicans “ducking town halls,” there is not enough to actually call it a GOP trend. The analyst, Kyle Kondik of the University of Virginia Center for Politics, said it would not be surprising. He pointed to 2009, when Democrats were faced with “pointed questions” on the Affordable Care Act and they were accused by Republicans of avoiding uncomfortable meetings with constituents. Kondik said he is not familiar enough with McSally to comment on her case, but she is not the only Republican in the state facing protests from voters demanding meetings. In response, many have scheduled telephone town halls, that they say can reach thousands of people at a time, whether the lawmaker is back home or in Washington. Ptak said McSally held two telephone town halls this month, including one on Feb. 14 that reached more than 4,000 people. During that call, McSally invited listeners to “vote” on whether or not they found the call useful: Of the 418 people who responded, 342 said yes and 76 said no, Ptak said. Kondik said a tele-town hall is better than nothing, but criticized the format as “choreographed” and set up for “the staff to have control over it.” He also said the lack of a physical presence can give lawmakers an easy way to avoid criticism or controversy. Chubon said she and Indivisible Southern Arizona founder Kristen Randall spent the last several weeks trying to get McSally to commit to their in-person town hall. But Ptak said the congresswoman could not accept the invitation because of the organizers’ affiliation with the Pima County Democratic Party, pointing to the fact that the party hosted petitions by Chubon’s group on its website and urged people to sign them. “Under House ethics rules, we are restricted from participating in political events like this one that have been organized in coordination with political groups,” Ptak said in a statement last week, saying the office had received that guidance from counsel for the House Ethics Committee. Chubon said neither she nor anyone in her group is affiliated with the Democratic Party – noting that Randall is a registered Republican – and that there was no ethical conflict with the meeting they were planning. McSally did meet with Chubon, Randall and other activists in her district office two weeks ago. They could not reach a compromise, but Chubon and Randall said they left thinking they could work with McSally to plan a future town hall. Meanwhile, they continued planning their own event. They rented a space, scheduled speakers, hired security and accumulated a 400-person guest and waiting list. “We were so organized, and we promised such civility,” Chubon said. Ptak said Green Valley News Editor Dan Shearer had reached out to McSally’s team “a few weeks ago” and offered to moderate an in-person town hall, something another editor said the paper has done in the past for other lawmakers. A Green Valley News article said no signs will be allowed in the meeting at the Good Shepherd United Church of Christ, which holds “about 300 people.” Doors will open at 3 p.m. for the 4 p.m. event that Shearer said will be first-come, first-served seating. While Chubon will be hosting the Tucson meeting, Randall said she will be bringing hundreds of Indivisible Southern Arizona members to the Sahuarita meeting, with some planning to be in line as early as 10 a.m.
“We are really focused on getting inside the building and engaging with our congresswoman,” Randall said.